Richard Vollin is a brilliant surgeon who is an obsessive collector of Edgar Allan Poe memorabilia. He is implored to help save the life of Judge Thatcher’s daughter Jean following a car accident and does so. Shortly after, Vollin becomes fixated on Jean, much to the consternation of her father who decides that Vollin is mad. Wanted murderer Edmond Bateman comes to Vollin, asking Vollin to surgically reconstruct his face so he can hide, but instead Vollin alters Bateman so that he is hideously deformed, promising only to fix his face if Bateman kills for him. Vollin then invites Jean, her fiancee and father to his home for a dinner party where he plans a nasty revenge using working models of Poe’s instruments of torture that he has constructed in his dungeon. The Black Cat (1934) was the first film to pair Boris Karloff and Bela Lugosi, the reigning stars of the new horror genre of the 1930s, and had been a modest hit. Lugosi had earlier appeared in Murders in the Rue Morgue (1932) for Universal. Universal quickly paired the two up again here in another vehicle nominally based on a work by Edgar Allan Poe. The Raven has about as much in common with its source as The Black Cat did – that is to say nothing at all. The original Edgar Allan Poe poem is quoted throughout – and there is the novelty of briefly seeing a dance interpretation of the poem – but semblances end there. The plot is an entirely invented one about a madman with a Poe obsession and features the notion of Bela Lugosi having built a collection of Poe torture devices in his basement. (Although the only actual device from a Poe story is a pendulum – as such, the film has more substantial claim to the title The Pit and the Pendulum than it does to The Raven). The film itself has a lunatic entertainment value. 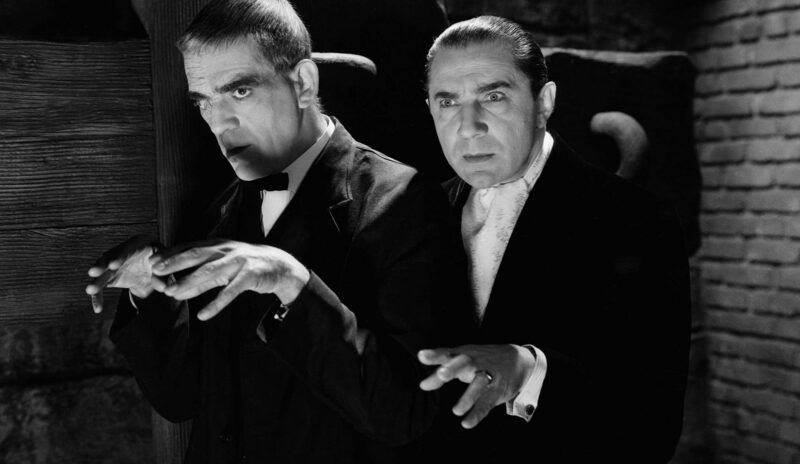 Bela Lugosi’s scheme involving blackmailing a wanted murderer into helping him by deliberately surgically disfiguring his face and attempting to kill off his rival for the heroine’s affections and her father using the torture devices in the house – including a pendulum, a room with compacting walls, even entire rooms that are elevators – is something that must have been conceived in a fever dream. Everything is maintained at a totally nutty level of melodrama. Bela Lugosi is of course completely in his element here and has a great deal of fun. The film itself has to be seen to be believed. The Edgar Allan Poe poem was later used, with only slightly more connection, by Roger Corman as The Raven (1963), a comedy about a duel between sorcerers, which also starred Boris Karloff. There are several other films loosely based on Poe that have the same name including The Raven (1915), an Edgar Allan Poe biopic; Ulli Lommel’s The Raven (2006) and David DeCoteau’s The Raven (2007), both about a mad killer; and The Raven (2012) featuring Poe against a serial killer. Director Louis Friedlander shortly after began to use the name Lew Landers and had a career that lasted from the 1930s until the 1960s, making various comedies, Westerns and serials, plus assorted tv episodes. Among his other genre works are the serial The Vanishing Shadow (1934); the old Dark House comedy The Boogie Man Will Get You (1942) with Boris Karloff; The Return of the Vampire (1944) with Bela Lugosi as a vampire; Inner Sanctum (1948) based on the popular radio series; the adventure films Jungle Manhunt (1951) and Jungle Jim in the Forbidden Land (1952); the Arabian Nights adventures The Magic Carpet (1951) and Aladdin and His Lamp (1952); and the horror film Terrified (1963).